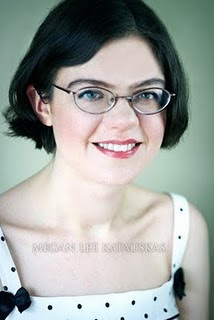 The Compulsive Reader: Interview with Jaclyn Dolamore! I have Jaclyn Dolamore on the blog today, answering a few of my questions. 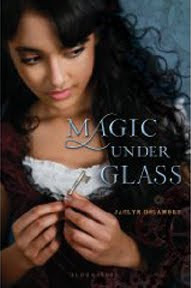 Jaclyn is the author of Magic Under Glass, which has gotten a lot of attention lately! TCR: I love the concept of a fairy trapped in the automaton; where did that idea stem from? JD: Originally, the automaton was not a stiff doll that played the piano. The love interest was just a guy, a normal guy on the outside, who happened to be clockwork on the inside. I've written tons of stories in my life about animated dolls and robots and things like that, so it wasn't really a new idea for me. But the idea of having him trapped came from a book I was reading about "The Turk", a chess playing automaton from the 18th century. It was a huge hoax for a long time because no one could figure out how he played chess (and won!). It turned out there was a guy concealed inside the cabinet where the automaton sat, in a terribly clever way, but it took so long to figure it out, and it made me wonder... what if there had not been a physical person in there, but an intelligence to the automaton? TCR: I really enjoyed the different cultures you created in Nim's world. Were they hard to create, and will we be learning more about her world? JD: My next two books will be set in the same world, so yes! I've always been fascinated by other cultures. At any given time I'm always reading about some other place; right now I have my nose in a book about the culture of Thailand, with books about Native Americans and 1920s Germany in the queue. I love travel (not that I've done much), other foods, world music, the customs of other places, the clothes... all of it! When I write a book, I can't help but think globally... I just hope I do justice to the cultures from which I draw inspiration. TCR: What are you writing now? JD: I'm working on MAGIC UNDER STONE, the sequel! TCR: If you could have any magical ability, what would it be and why? TCR: Have you read any good books lately you'd like to recommend to your readers? JD: I'm on a Mitford kick! I'm almost done rereading Nancy's novels Love in a Cold Climate and In Pursuit of Love, and starting on the autobiographical Hons and Rebels, by Jessica Mitford. They are so witty, I adore them. Thanks so much, Jaclyn! Magic Under Glass is amazing, so be sure to buy it !